I first came across the idea to drink hot lemon water each morning while doing Sadie Nardini’s Daily Ohm Course, 21 Day Yoga Body (which I loved and will be blogging about soon!). She suggested having an 8oz glass of warm water with half a lemon’s juice 20 minutes before breakfast to detox each day (you can also add a little honey or agave syrup to taste if it’s too tart for you). I wanted to learn more about drinking this tart H2O every morning. If you search for “hot lemon water” you will come across a ton of sites talking about its benefits and even more trying to talk to you into using as a total detox or weight loss miracle. 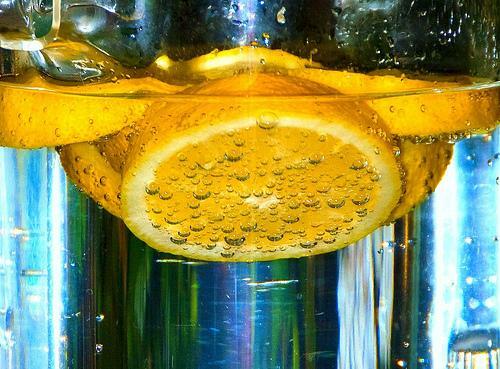 While lemon water is detoxifying and it can help you lose weight, I doubt it should not be the main component of your healthy diet and exercise plan. Below is info from one the best articles I came across in my search. Lemon, being a natural antiseptic medicine, can participate to cure problems related to skin. Lemon is a vitamin C rich citrus fruit that enhances your beauty, by rejuvenating skin from within and thus bringing a glow on your face. Daily consumption of lemon water can make a huge difference in the appearance of your skin. It acts as an anti-aging remedy and can remove wrinkles and blackheads. HOWEVER, I read somewhere else about the damage the extra acid can cause to your enamel. So I picked up some Pronamel (the gentle whitening kind because I may or may not need the protection against wine stains as well…). * I believe some studies have shown that it helps increase metabolism! I’ve been drinking a cup of hot lemon water about a half hour before breakfast (or while I check twitter and read A Year of Living Your Yoga each morning) for over a month and really do think it’s helped with my digestive system and skin. However, I’ve also been eating drastically healthier in the past few months which has made a big difference.